POSTED: Tue, 01/13/2015 - 06:00 | POSTED BY: Traci C.
The video technique was developed to provide naturalists with a better tool to monitor the health and safety of the animals in the wild and in captivity. Peter Carr, a research engineer at Disney Research worked with Joseph Soltis who works as a research scientist at Disney's Animal Kingdom and Victor Fan, a Disney Research lab associate, worked on the project. They presented their findings at the 'Automated Analysis of Video Data for Wildlife Surveillance Workshop' that was held at the IEEE Winter Conference on Applications of Computer Vision in Hawaii on January 6-9. 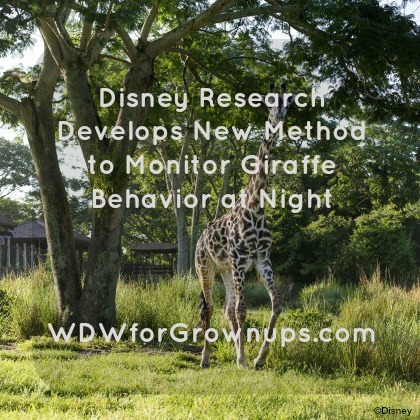 The new method of observation automatically reviews videos of nighttime giraffe behavior that was captured by infrared thermal cameras and will highlight only unusual behaviors. I love the efforts that Disney put in to making their animals comfortable, healthy and happy. They have truly made some groundbreaking advances in the community.